National Talent Research Exam (NTSE) is one of the best scholarship programs from High School Students. Students of class 10 from throughout the country can appear in NTSE Exam which is conducted in two stages. The National Level wise which is conducted by NCERT. 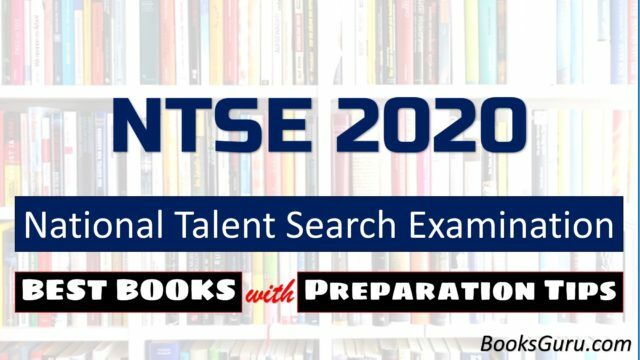 There are hundreds of books available in the market for the preparation of NTSE but it’s next to impossible for any student to go through all those books. So here we have recommended some of the best books for NTSE preparation which you must go through to crack NTSE. Mental Ability Test (MAT): This part consists of a total of 50 questions based on logical and analytical reasoning to tests the candidate’s reasoning, ability to think, evaluate, ability to discriminate and visualize. Scholastic Aptitude Test (SAT): This is the main and most important part of NTSE stage I examination. It consists of a total of 150 questions from Science, Mathematics, Social Science and English Language. This section judges the student’s reading abilities, interpretation, evaluation and general awareness of the subjects. There are a Qualifying Marks: 40% for General Category students in and 32 % for ST, SC and PWD students (in both papers). Before starting your preparation for NTSE look back at yourself and write down some of your weak and strong points. This will decide how much time you are going to invest in which topics. Along with this take a look at NTSE syllabus and make a plan according to your current position. NCERT books are considered the most prestigious books at the present time and you should also follow the same. Go through the all NCERT textbooks of class IX and X. Also take a look at class XI NCERT books only for those portions which are considered in the syllabus. MAT section tests the student’s mental ability, this section consist of 50 questions and this is the section which provides a very good score for every student. So, master this section so that you can grab a good score from this section. Solving sample papers and giving mock tests will tell you about your preparation, how much time you are taking to solve a sample paper? These all will decide how good you are going to do in the real test. There are numerous free sample papers and mock test of NTSE both stages are available on the internet, simply solve those sample papers in the last month of your preparation. Following previous year question papers don’t mean that the questions are going to repeat every year, following previous year papers will give you an idea about the pattern and the level of questions asked in recent years and this will help you a lot making a full proof strategy. Having a practice of any field makes a person master of that field, that’s the strategy you should also follow to crack NTSE both stages. The more you will practice the more your confidence will grow, your problem-solving speed, subject knowledge, and accuracy will become very high.